FC Porto have progressed to the group phase of the Champions League, successfully raising the number of Portuguese participants to three, after eliminating LOSC Lille over two legs. The match at the Dragão between Portugal and France's third-best teams from last season was a touch more one-dimensional than expected, with Lille favouring a more reactive approach, despite trailing by a one-goal margin from the first leg. There was some curiosity as to whether coach René Girard would remain faithful to the 4x3x3 formation he tends to deploy in the tougher matches or whether he would instruct his players to be more proactive with and without the ball. FC Porto coach, in turn, fielded the exact same starting XI he had presented last Wednesday in France. One of football's greatest truisms is that games are not won on paper, which is usually a fair point when supporters and commentators discuss the virtues and flaws of the tactical arrangement of any given team. Case in point, both FC Porto and Lille took to the pitch organised in a 4x3x3, but the way went about it couldn't have been more different. While Les Dogues kept allowing FC Porto time on the ball and (sometimes too) patiently waited for their opponents to get caught in possession - which almost came to fruition when starlet Rúben Neves underhit a pass, forcing Maicon to a desperate last-ditch effort - the Dragons stayed the course they have undertaken under Lopetegui and offered a very fluid display during the first 20 minutes. Indeed, FC Porto's long(ish) spells of possession were followed by quick switches of play in an attempt to find vulnerabilities down Lille's weak side (the flank the ball is not on) and making the most of the excellent Brahimi and Óliver Torres. Despite being nominally stationed on the wings, both these players tended to drift inside and allow full-backs Danilo and Alex Sandro to motor forward. Hector Herrera did not have the easiest or most successful season last term, but his particular traits allow him to shine on specific circumstances (as shown at the latest World Cup). Here he was able to take advantage of Lille's vulnerabilities in midfield. The gaping holes that kept surfacing all over the centre of the pitch were a direct result of the team's man-marking in midfield. All it took was for Óliver or Brahimi to come inside to drag Balmont and Gueye out of position, which allowed Herrera to sprint in behind (usually at Gueye's expense), particularly down Lille's right side. Lille midfielders could be seen swapping man-marking duties on the pitch, instead of approaching the challenges in zonal fashion. When compared to last season, there are significant enhancements as far as FC Porto are concerned. With more men closer to the ball when in possession, the Dragons are often better equipped to react to giving the ball away, usually being fast at keeping their opponents from transitioning into attack. 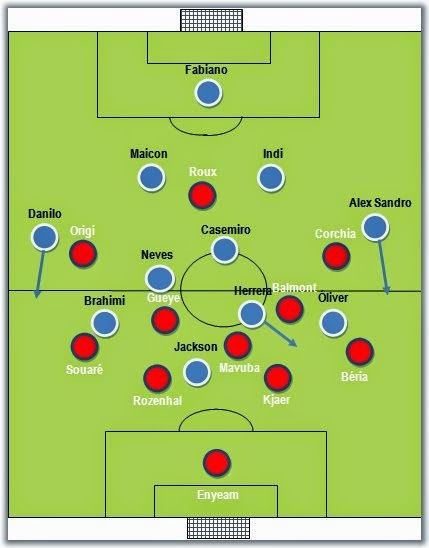 The few times that it didn't happen, Lille were unable to make the most of it because they invariably looked to the wings to provide crosses, allowing FC Porto defenders precious time to retreat into their positions. On the other hand, it was already possible to see distinct moving and passing patterns, the concern seeming to be to offer several passing options to the player with the ball (for instance, if the centre-back has the ball at his feet, it's quite likely the full-back will offer width, the winger will come inside to offer a passing option and the midfielder on that side will sprint in behind on the wing). Nevertheless, there were some periods during which Lopetegui's charges were not in total control of matters and where, against stronger opposition, slip-ups could have been punished. The team seemed somewhat surprised when the coach asked them to retreat after Brahimi's beauty of a first goal from a direct kick and Lille could have effectively got back into the match. Four wins in four matches with no goals conceded is way too short to offer any kind of perspective, but Lopetegui should at least be praised for giving the team a solid identity (something the side lacked throughout all of last season) and for sticking to 17-year-old Rúben Neves on such demanding matches. The Portuguese midfielder eventually ran out of steam, making way for Evandro, who brought some much-needed stability to a midfield that was clearly coming short by the middle of the second half. A couple of good chances for Lille ended up yielding nothing and it would actually be one of Les Dogues to kill the tie: left-back Pape Souaré's poor pass offered Brahimi the possibility to run at Lille's defence and play Jackson Martínez in with a perfectly weighed pass. The tie was definitely over. A very positive result for both FC Porto and Portuguese football. The Dragons' expensively assembled team needed to make sure they were in the Champions League to justify the huge investment made and the weapons at their disposal make them clear favourites for the Portuguese title (even though one can't help but feel this is the club's swansong as far as high-profile signing are concerned in a desperate attempt to wrestle the title from the hands of Benfica). There already seem to be some good routines and patterns in the squad, and the positive results will surely help the players believe their coach's ideas. Still, this possession-based approach has its drawbacks, namely when the centre-backs are called upon to start out attacks or when opponents remain compact and patient.